Giving Back One Bucket At A Time! How to Donate to the Buckets of Love Foundation and Help us Make a Difference! Make monetary contributions through the PayPal link that is listed on each page of this website. Donate your time by Activating Buckets of Love in your community. If you live in Delaware you can become a Buckets of Love Ambassador, and donate your time with us gathering items, building buckets and donating them to children in need of cheer. 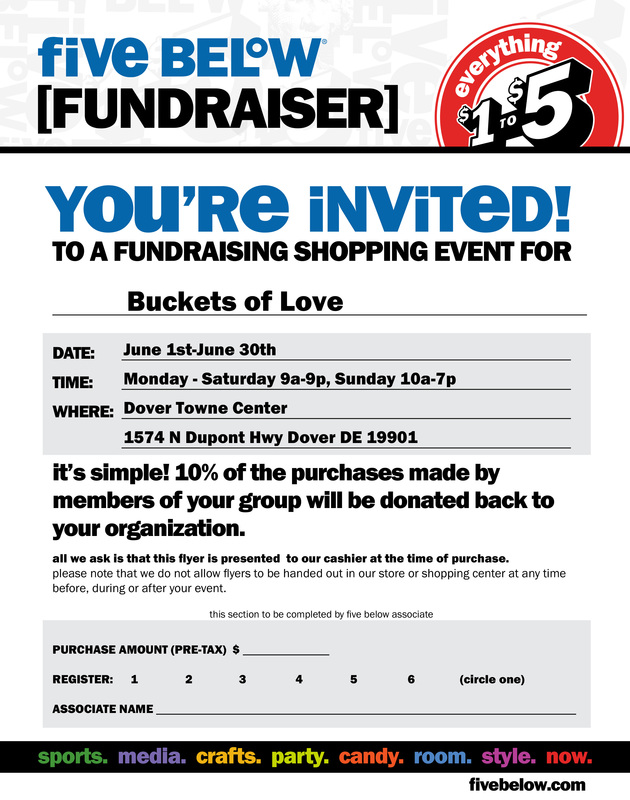 Go shopping at the Dover, Delaware Five Below Store and present a printed copy of the certificate on this page. 10% of your purchase will be donated to the Buckets of Love Foundation. Again, thank you for your contribution! Acknowledgement of your contribution will be provided for tax purposes. Please be sure to include your name and address. If you are sending a contribution in memory or in honor of someone we will be happy to notify the honoree's family. Please include the name of the honoree, and the name and address of the honoree's family where the notification should be mailed.